On December 1, 2013, the Holy Synod of Bishops of the Patriarchate of Constantinople glorified as a saint, the Elder Porphyrios of Mount Athos, Greece. 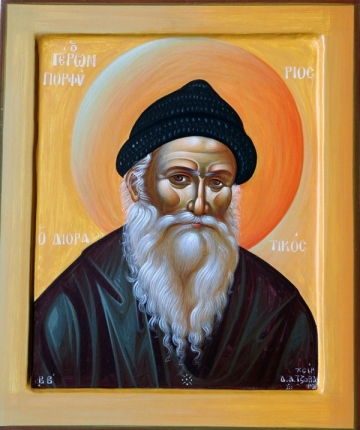 St. Porphrios is one of a number of contemporary holy men who sought God on the Holy Mount of Mount Athos and wer filled with the gifts of the Holy Spirit. Mount Athos is a peninsula in northeastern Greece that is called “The Garden of the Theotokos”. This sacred ground has been reserved for the practice of the monastic life for over 1,000 years and is the home of 20 major monasteries and numerous small sketes and hermitages. This new saint of our Orthodox Church was born on February 7, 1906 in Greece and was baptized with the name of Evangelos. His parents were poor but pious farmers, his father serving as the village cantor who at times chanted the services with St. Nectarios. Due to their poverty, the Elder’s father was forced to emigrate to America to work on the construction of the Panama Canal. The young Evangelos only attended the village school for two years, starting work at a young age first in a coal mine and later in a grocery store in order to help support his family. Under the influence of his pious parents and from reading the Lives of the Saints, young Evangelos was determined to follow the examples of these holy saints. At the age of 15 he set off for Mount Athos to devote himself to the monastic life, living at the Skete of Kafsokalivia. There, under the guidance of the elders in the monastic life, Evangelos devoted himself to prayer, fasting, and struggle against the sinful passions. During his nighttime prayers, he would at times strip to the waist in order to help him pay attention and to keep from falling asleep. He immersed himself in the liturgical services of the Church which he participated in for hours each day, learning many of the prayers and hymns by heart. With only two years of formal education, the Bible and the services of the Church became his tutors. Young Evangelos was eventually tonsured a monk and given the name Nikitas. While still a teenager, Nikitas was blessed to receive the gifts of the Holy Spirit. He was able “to see” people who were arriving at the monastery while they were still a long distance away. He was able to bring God’s healing to people with a touch. The hidden thoughts of people were revealed to him. He was able to see the past, the present and the future at the same time. He confessed these experiences to his spiritual father who advised to him to be cautious about this gift and to tell no one. The experienced monk knew well the warning of St. Paul that “Satan himself transforms himself into an angel of light” (2 Corinthians 11) meaning that mystical experiences and visions can be temptations of the devil to lead a person into pride and delusion. By the age of 19, Nikitas’ health problems forced his elders to move him to less remote monastery: the Monastery Lefkon of St. Charalambos. There at the age of 21 he was ordained to the diaconate and the priesthood and given the name Porphyrios. At this monastery and in several parishes, he functioned as a spiritual father hearing confessions often for hours each day. His spiritual gift of discernment, the ability to read the hearts of those who came to him, led many to genuine repentance and a new life. With the outbreak of World War II, Father Porphrios was assigned to the Athens Polyclinic in the heart of the city. Here he served the sick for thirty years, making his rounds through the hospital wards, celebrating the sacraments, praying with and guiding the sick. In February, 1970 he retired from his position as hospital chaplain and began work on his lifelong dream: to establish a monastery in which his pious spiritual daughters could completely devote themselves to the Lord. In 1981 the Holy Convent of the Transfiguration of our Savior was formally established and it was here that the Elder began to live. As he advanced his years, Elder Porphryios suffered from numerous health challenges: kidney disease, heart attack, loss of vision and in 1987 becoming completely blind. Knowing that his end was nearing his one desire was to return once more to his little hut on the Holy Mountain – Mount Athos. After receiving Holy Confession and the Holy Eucharist, the Elder departed this life on December, 2, 1991. You greatly delude yourself and err, if you think that one thing is demanded from the laymen and another from the monk; since the difference between them is in that whether one is married or not, while in everything else they have the same responsibilities…Because all must rise to the same height (of virtue); and what has turned the world upside down is that we think only the monk must live rigorously, while the rest are allowed to live a life of laziness. The only difference a monastic and a lay person is that monk and nuns are in an environment that nurtures and encourages their commitment to live as disciples of Jesus. Our battle is much more difficult, we are surrounded by a culture that inhibits the practice of prayer, humility, chastity, struggle against our sinful passions. May the life and witness of the Holy Elder Porphyrios help and inspire us as we walk on this narrow path that leads to life.